Northern Ireland's rising star of sportscar racing, Daniel Harper, has come up with a unique way of building support for his 2019 campaign in the Porsche Carrera GB Cup series. For a £50 donation, supporters of the 18-year-old Hillsborough driver can have their names on the roof of his Porsche and, when pre-season tests got under way this week, his JTR team Carrera was already displaying close to 100 contributors. And just to show their faith is not misplaced, Harper proved to be the quickest driver at Donington as the build-up begins to the opening rounds of the series at Brands Hatch on April 6-7. 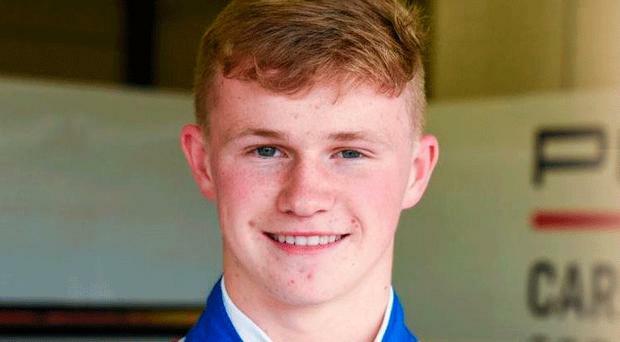 A multi-champion in quads and karts, Harper has risen rapidly through the racing ranks, earning a scholarship to compete in the UK Junior Ginetta Championship at 15, winning seven times, and before he was even legally allowed to drive on the road he was selected by Porsche for a two-year development programme in the GB Carrera Cup. In his first season in the Porsche, he won twice and recorded more pole positions and fastest laps than any other driver. Now Harper is seen as one of the favourites to lift the Carrera Cup and emulate fellow Ulsterman Charlie Eastwood, who won the series in 2017. But racing is an expensive business and even with the backing of Porsche and his headline sponsor IFA Global Logistics, Harper still has to find extra finance to fund his challenge - hence his unusual names on the roof initiative. Meanwhile, Eastwood is returning to the Blancpain European Endurance Championship this year with the TF Sports Aston Martin team. He will share Oman Racing's new GT3 Vantage with Ahmad Al Harthy and Salih Yoluc in the Championship which begins at Monza on April 14. Joining him in the series will be another Ulster driver, Steven Kane, who will be part of the Bentley team. And Richard Lyons will continue his long distance commute from Hillsborough to Japan where he will drive a GT3 Audi for the Hitotsuyama team in the Super GT series.